There comes a point in every national election year when I reach total saturation and have to tune it all out to stay sane—the nonstop streams of vitriol, the spectacles of electoral dysfunction, the ads, the ads, the ads. I’m sure I’m not alone in this. But imagine how differently we could feel about presidential elections if people like, I don’t know, Dizzy Gillespie could get on a major ticket? That’s what might have happened in 1964 if “a little-known presidential campaign… had been able to vault the millionaires-only hurdle.” What began as one of Dizzy’s famous practical jokes, and a way to raise money for CORE (Congress for Racial Equality) and other civil rights organizations became something more, a way for Dizzy’s fans to imagine an alternative to the “millionaire’s-only” club represented by Lyndon Johnson and Barry Goldwater. 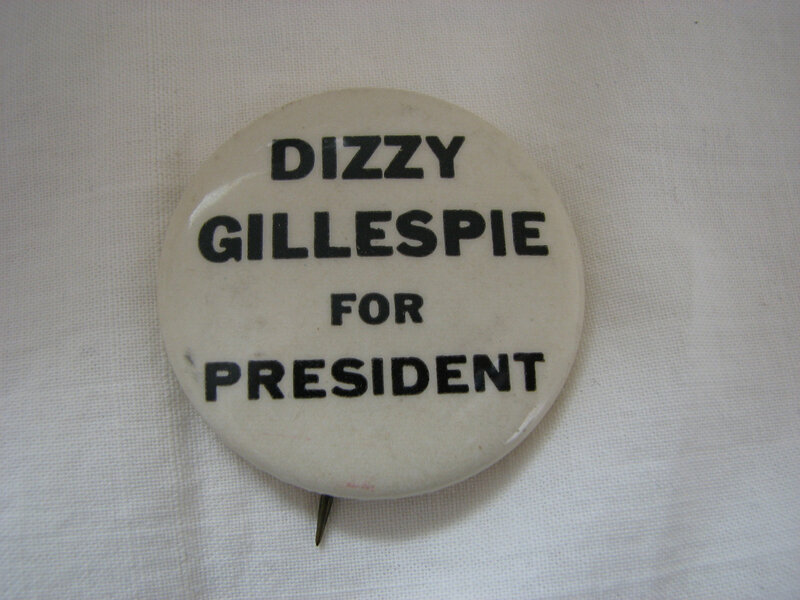 Gillespie’s campaign had “Dizzy Gillespie for President” buttons, now collector’s items, and “Dizzy for President” became the title of an album recorded live at the Monterey Jazz Festival in 1963. It’s definitely groovier than either one of our current campaigns. Dizzy “believed in civil rights, withdrawing from Vietnam and recognizing communist China,” and he wanted to make Miles Davis head of the CIA, a role I think would have suited Miles perfectly. 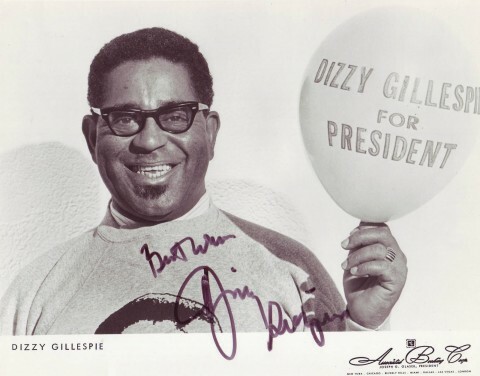 Although Dizzy’s campaign was something of a publicity stunt for his politics and his persona, it’s not unheard of for popular musicians to run for president in earnest. In 1979, revolutionary Nigerian Afrobeat star Fela Kuti put himself forward as a candidate in his country, but was rejected. More recently, Haitian musician and former Fugee Wyclef Jean attempted a sincere run at the Haitian presidency, but was disqualified for reasons of residency. It’s a little hard to imagine a popular musician mounting a serious presidential campaign in the U.S., but then again, the 80s were dominated by the strange reality of a former actor in the White House, so why not? In any case, revisiting Dizzy Gillespie's mid-century political theater may provide a needed respite from the onslaught of the current U.S. campaign season. I was at the 64 Jazz Festival and have a home 8 mm movie if it. At the evening performance, Diz was into one of his numbers when all of a sudden a guy went in front the stage wirh a flag which said “Diz for Prez” which totally broke him up. It took him a while to get started again. I’m a filmmaker and I’m working on a project for a documentary suDizzy for president. I’m looking for any news and laboriously printed materials and videos on this topic. surfing the internet I found your post in which I learn that you were there that day when it was announced the candidacy of gillespie and it also has a 8mm film. now I kindly ask if he is willing to send it to me in a vision. of course I would pay the transport costs. Possibly would be willing to lend it if I manage to make this documentary. for now thank you for the time you want to devote. when did dizzy Gillespie get cancer? Of course, Gillespie never had a chance. He campaigned into early 1964 and then, as Ramona Crowell said, “it sort of fizzled out.” Gillespie declared again in 1972, but withdrew when he found out that running for political office was against the principles of his newfound Baha’i faith. “I’d have fought for a disarmament program and the establishment of a world government, somewhere … I would see that everyone had enough to eat and some clothes and a decent place to stay. Everybody, every citizen, is entitled to that. Education would be beautiful, free, subsidized by the government. All of it. Anytime you wanted to learn something, I’d pay you to do it. Hospitalization would also be free. Do you still have that footage of Dizzy at the 64 Jazz Festival?